The Belfast Botanic Gardens has a fine specimen of this less usual lime variety. You will find it just to your right as you enter the gardens through the Malone Road gate. 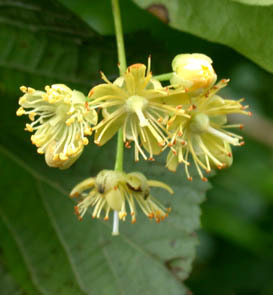 T. 'Petiolaris' flowers about a month later than the common lime (Tilia x europea) and is distinctive with dark glossy leaves which have a silvery underside. The leaf stalks are longer than in other limes. 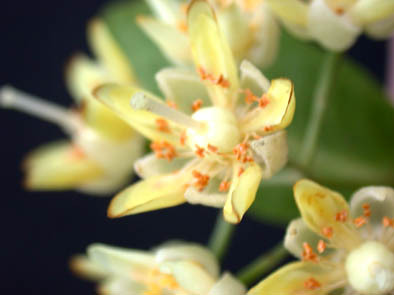 The flowers are are highly scented and are also distinctive, the cream petals being longer than the stamens (compare with common lime in photo bottom right). This lime is not susceptible to the aphid problems of the common lime, but is not for the small garden as it can reach over 30 m. in height. Its taxomomic status seems to have had a confused history. Early books treat it as a distinct species (eg. 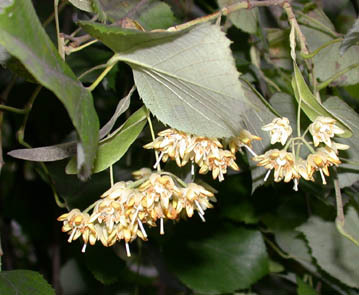 RHS Dictionary of Gardening), whereas others (eg The Trees of Britain and Europe, Mitchell and Wilkinson) as a variety, possibly of garden origin, of Tilia tomentosa. 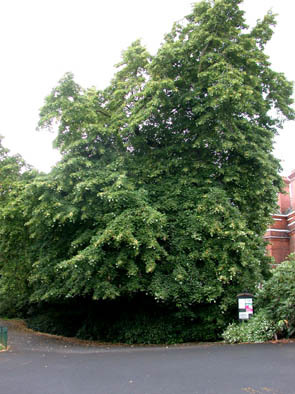 The 2007-2008 RHS Plant Finder, nowadays authority on horticultural nomenclature, treats it as a variety of Tilia heterophylla which we will follow.